There you have it again – the same company, the same city and a very similar incidence. The incident came to light when a Facebook user made an update, according to which, an Uber driver named Vinod tried to forcibly kiss his sister while she had hired the Uber cab services in Gurgaon. When the complaint was launched with Uber, he got a automated templatized response, even though the matter was extremely grave and serious. Here is the user’s Facebook update . My sister availed your cab service, last night for Gurgaon & your driver Vinod tried to kiss her forcibly & even after registering complaint with you morons there has been no action, no update form your end. You people are pathetic, you still don’t have any mechanism in place. What is making you people wait for so long?? Looking for a escape mechanism?? I am looking foe immediate, non-mechanical, machine oriented revert. Get teh culprit punished or you are in heaps of trouble for shielding him. 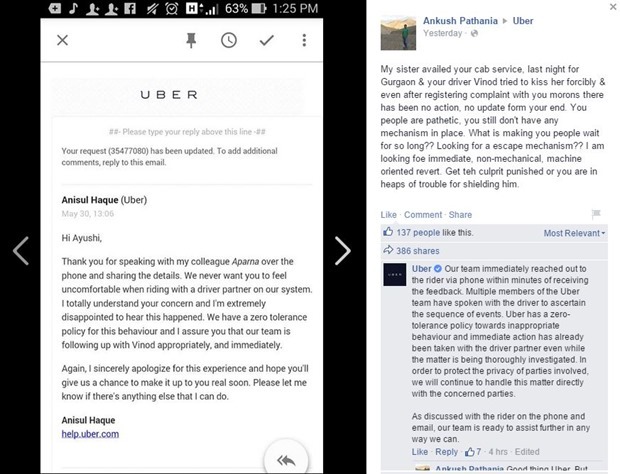 The user also posted the automated response from Uber to which he received the response upon filing the complaint. With the update going viral, Uber people seem to have got in action (although very delayed) and posted a response today afternoon at around 1pm. Our team immediately reached out to the rider via phone within minutes of receiving the feedback. Multiple members of the Uber team have spoken with the driver to ascertain the sequence of events. Uber has a zero-tolerance policy towards inappropriate behaviour and immediate action has already been taken with the driver partner even while the matter is being thoroughly investigated. In order to protect the privacy of parties involved, we will continue to handle this matter directly with the concerned parties. As discussed with the rider on the phone and email, our team is ready to assist further in any way we can. how did such an incidence happen again? Uber had earlier announced that they have implemented real-time-SOS button in their app and also partnered with SafetiPin to ensure safety of their passengers. However, looks like these steps have been useless. Also, Uber had mentioned after the first incident that they will carry out strict re-verification of all their cab drivers, though, that seems to have been ineffective as well. With occurance of second such incidence, there is a real possibility that a complete axe may come down in Uber service in India! Infosys Dress Code Goes Casual All Week, Should Other IT Companies Follow Suit?